First lockout for BBL Fantasy is tonight. See some sample teams. Happy Big Bash day everybody! Things kick off tonight and that means it’s time to put the final touches on your team and stay glued to the television to make sure your players are actually named! This article should simply show you a few basic structures of what a team “should” look like and how you can best utilize different strategies. Honestly, if you feel confident about your current team or you don’t have a few players that reoccur in this article, don’t panic. 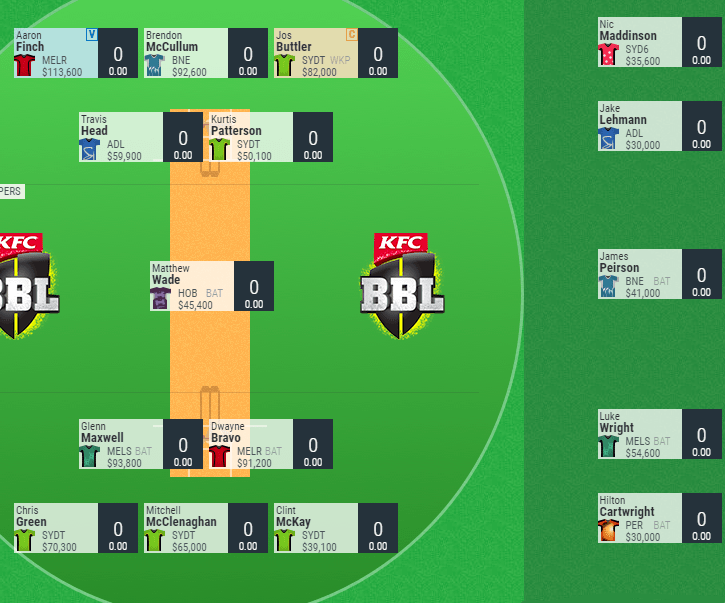 BBL Fantasy is all about the little differences between teams and you should back yourselves in. Edit: Clint McKay, Gurinder Sandhu and Jackson Bird NOT named in squads for tonight’s game. This is a team designed to take the Sydney Thunder’s double game into account, but not be overly reliant on it. The main strength of this team is the DPP flexibility you get through Tim Ludeman, Hilton Cartwright and James Peirson on the bench. 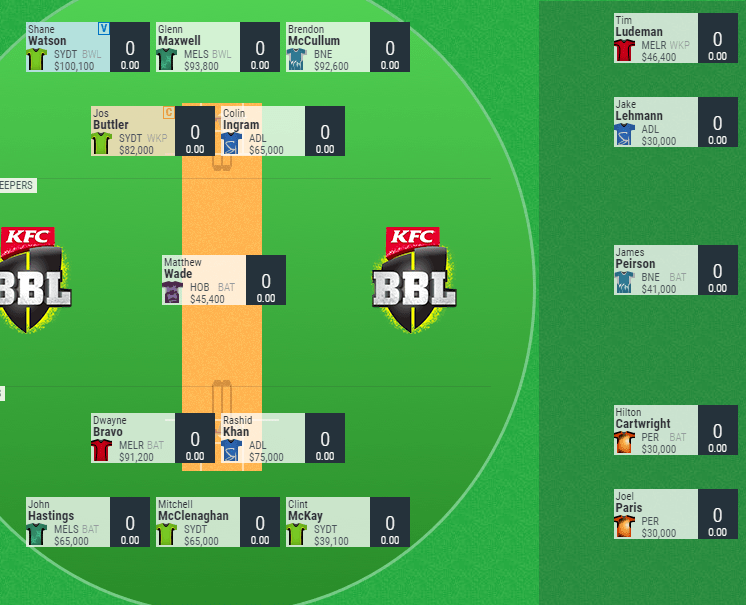 With BBL Fantasy being a game that can come down to the last minute when it comes to waiting for team selection or wash outs, this flexibility gives you so many options. Other than that, it’s a pretty standard team that takes minimal risks aside from not boasting either of Chris Lynn or Aaron Finch. Saving that money however allows you to slot Jos Buttler in at BAT4. It feels strange critiquing Warnie’s team when I’m usually the one pestering him for Fantasy advice… Anyway, Warnie’s team may look Thunder-heavy at first, but that’s probably just because Watson is with the bowlers. Sandhu is a risk given the Thunder may bypass him to go for two spinners like they did most of last season and Aiden Blizzard and Matt Renshaw are looking less likely to be picked for their respective sides. Travis Head and D’Arcy Short are very crafty selections however. This team is designed to get you through the first two rounds of double games and put you in a position to score massively early on in the tournament. You’ve got five players taking advantage of the Thunder’s double-game and then you have plenty of Heat and Scorchers players to maximise round two. You can downgrade Buttler to Peirson and upgrade Green to Willey and Patterson to McCullum after round one as well. Obviously this is risky, but it could be very lucrative if it works. If you just want to build a really strong team to carry you through the tournament instead of going from week to week relying on trades and bye rounds, then this is the team for you. You have a nice mix of players with no real weak points. Jake Lehmann is more than good enough to hold a spot on field for a week while David Willey sits his bye out and there’s plenty of mid-priced value. I don’t recommend ignoring the double-game rounds to this extent, but it’s definitely worth looking at. It’s all about finding the balance between team’s three and four. *Takes a deep breath* – okay, so this is what I’m currently going with. My general philosophy is load up on the double-game players, but make sure the team around them is solid. I’m not personally sold on Shane Watson – especially at 100k – and so I’m going with Aaron Finch instead. 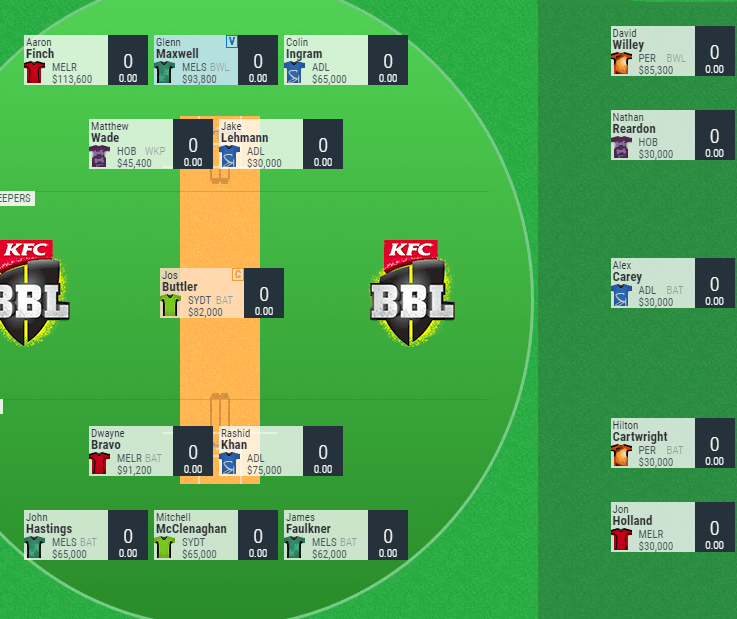 My plan is to bench Matthew Wade (bye week) in round two in order to take advantage of Peirson’s double-game round and I’ll downgrade Green to Ben Cutting. Luke Wright will come on and McKay will simply be my bench depth. I don’t really trust many of the $30,000 batsmen and so I’m going with Nic Maddinson who seems like he could be really good value if he finds form. The countdown is on! What does your current team look like and what strategy are you going with? Let us know and good luck! Very interesting. Looks like they’re going with Andrew Feketee of all people instead of him. Anyone got a league with spots? I like it. Different to what most people are going with in a few areas, but nothing wrong with it. Good stuff. 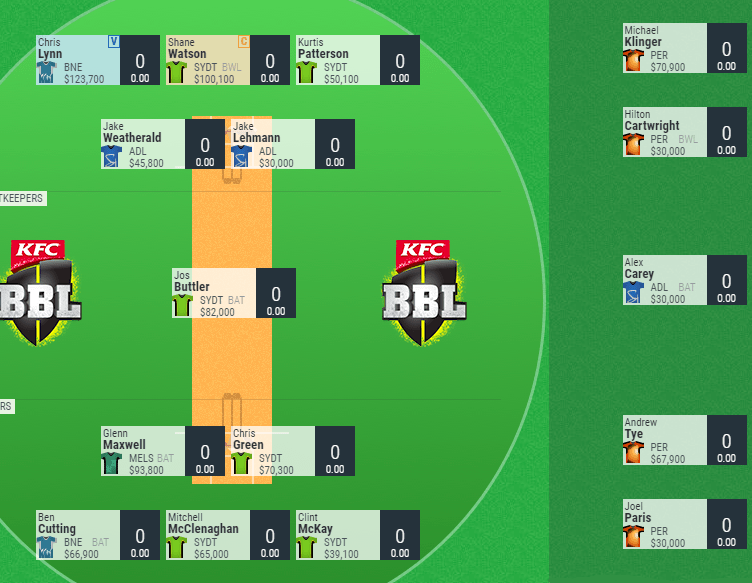 Is there just automatic emergencies in BBL Fantasy? I want to loop Sams score by putting Cartwright on the field. For Round two, play Joel Paris (two games) or John Hastings? 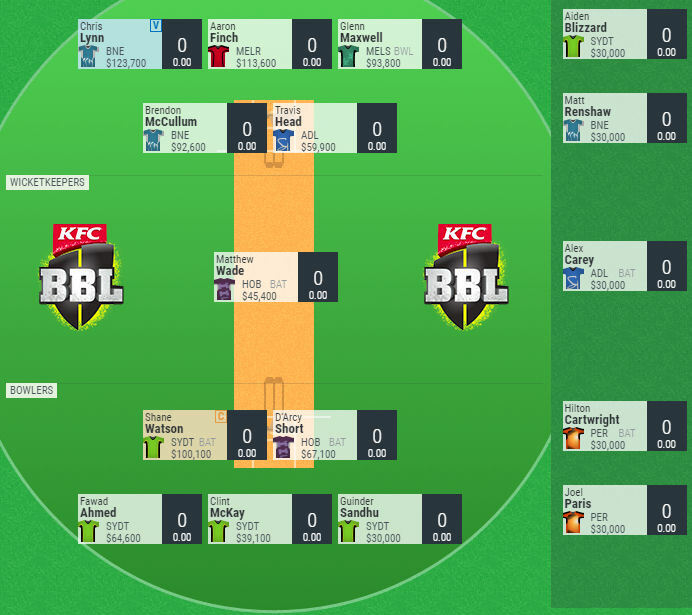 Get your BBL tips from Nic to help you win Moneyball cash. Win some cash today with Moneyball and Nic's tips. 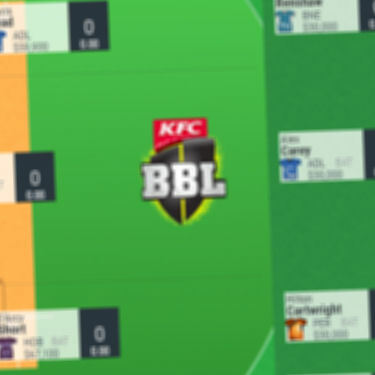 $5K to win today in the BBL. Get tips now.